Michelle Williams is superb as Marilyn Monroe, as she was when shooting The Prince and the Showgirl (UK-US, 1957); Kenneth Branagh is no slouch as the director-star Laurence Olivier either. The only thing that Williams lacks, as Monroe, is the voluptuous curves; other than that, it is an entirely convincing portrayal. She’s particularly good at Monroe’s insecurities in front of camera. Marilyn was a notoriously unreliable actor, in her final years, and this film does give an insight into how her vulnerability affected her behaviour. Despite all this, I disliked the film. Why? It’s based on Colin Clark’s memoir who got a job with Olivier’s film company because of the silver spoon in his mouth (dad was Kenneth of Civilisation fame). Sure, that’s the way it was but it still nauseates me. Come to think of it, it’s still like that. Getting a foot on the film industry ladder often requires working for nothing so you need mummy and daddy to support you. Class is the great British divide. Oh, and let’s reinforce it shall we by reducing the income tax for those who earn over £150k in today’s budget. And let’s attack the deficit by reducing corporation tax; brilliant! That will mean welfare payments will have to be reduced, but hey! who cares about the poor? They get what they deserve! George Clooney’s at it again, co-writing and directing a terrific political movie (see also Good Night, and Good Luck (US, 2005). It’s as if he’s, almost single-handedly, trying to resurrect the political cinema that Hollywood produced in the early 1970s. The Ides of March reminded me of The Candidate (1972); though, as I haven’t seen it for over 30 years I’m not sure how much water the comparison will hold. 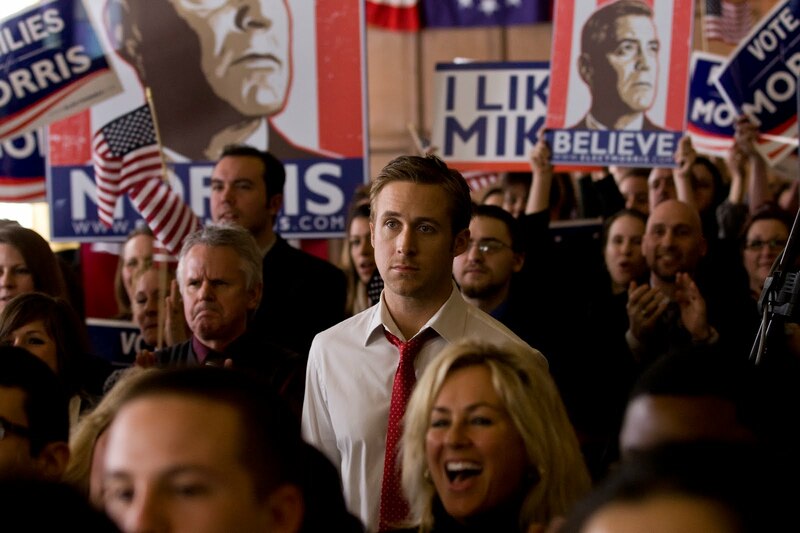 Both deal with the process of becoming a presidential candidate; The Ides is a convincing portrayal of ‘behind the scenes’ of the electoral machine and an indictment of the state of American politics. Clooney plays the candidate, Govenor Mike Morris, whose policies are entirely sensible (he’s not religious but will defend the right of anyone to practice their religion as long as it doesn’t impinge upon others) but almost certainly impossible to state in the ‘land of the free’ because it’s in thrall to right-wing lunacy. There’s a real frisson hearing Clooney speak political sense; it’s similar to the moment in Bulworth (1998) when Warren Beatty’s senator invokes socialism! A top notch cast includes Ryan Gosling as Morris’ idealistic PR advisor; Philip Seymour Hoffman and Paul Giamatti support. Alongside Danish TV’s Borgen (2010) it’s the best political text I’ve seen this year. Jonathan Rosenbaum makes the point that while this film is about the forties, it’s set on the day of the Nazi surrender, it’s overlayed by a fifties’ sensibility. 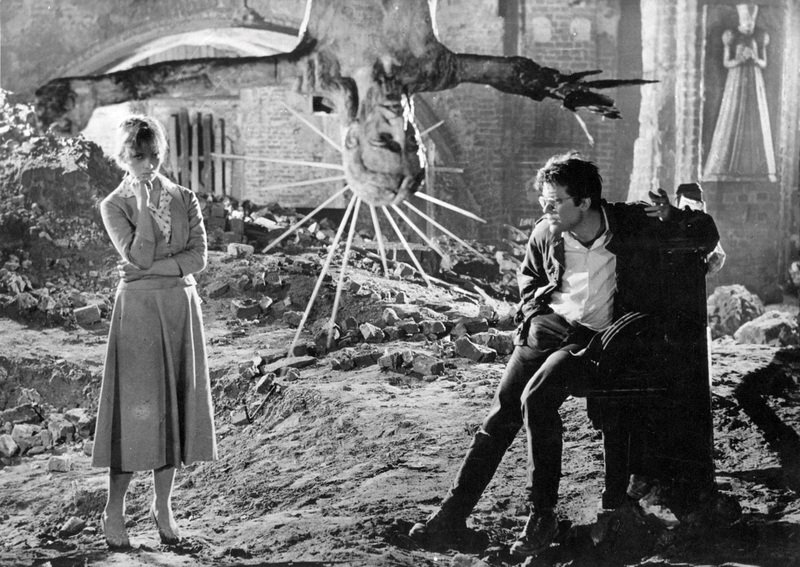 This is evident through the James Dean-like Zbigniew Cybulski (though Rosenbaum cites Brando) but also in the European Art cinema style in which its shot. The ‘heavy’ symbolism of the still above is a good example. Add to that the melodrama of the young man, who’s fighting against the Communists and wrestling with his conscience whilst falling in love with the beautiful, and melancholic, barmaid, you have cinema made for me. This blu-ray edition looks terrific and so emphasises the wonderful cinematography with stunning Expressionist lighting. Director Andrezj Wadja was clearly influenced by Bergman, I love the horse that simply walks into the mise en scene, but also Welles, particularly his use of deep focus. The film brilliantly dissects a moment in history when everything for Poland was going to change (except in a way it didn’t as they, once again, became dominated by a foreign power). 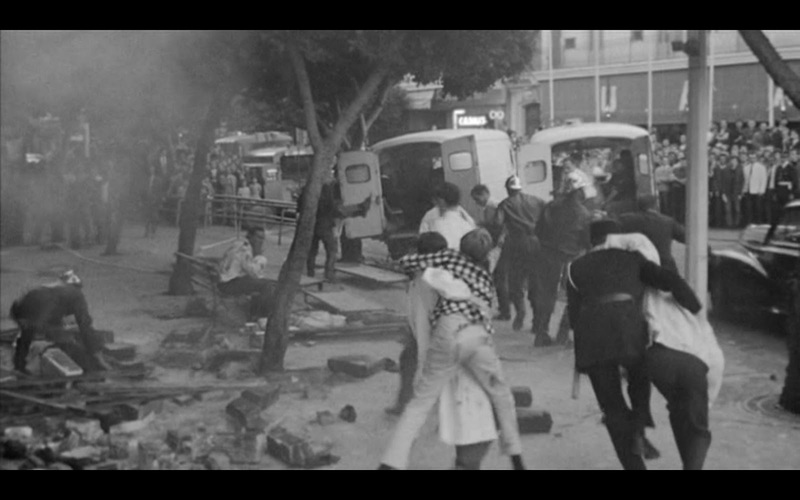 The possiblities of the time, those grabbing power, the splintering of families due to the war, are all portrayed in an affecting human story. Cybulski plays Maciek who’s been sent to assassinate a Communist Party official; he fails but has the night to fulfill his task except that’s when he meets the barmaid. The official’s son is part of the reactionary forces that are opposing the Russian takeover, however the bourgeoisie’s grab for power is in full swing anyway, shown by the small town major’s celebration at being appointed a minister. The climax of the party, where they are all drunkenly dancing to a bastardised version of a Polish national song, is truly surreal. As is the denouement for Maciek, in a setting worthy of Bunuel. I’m not sure if Wadja’s in or out of fashion at the moment, very few of his recent films have been distributed in UK; he’s still making them and is 86 next Tuesday. Ashes and Diamonds forms the third in his ‘War Trilogy’, A Generation (Pokolenie, 1955) and Kanal (1957); there are all must-see films. 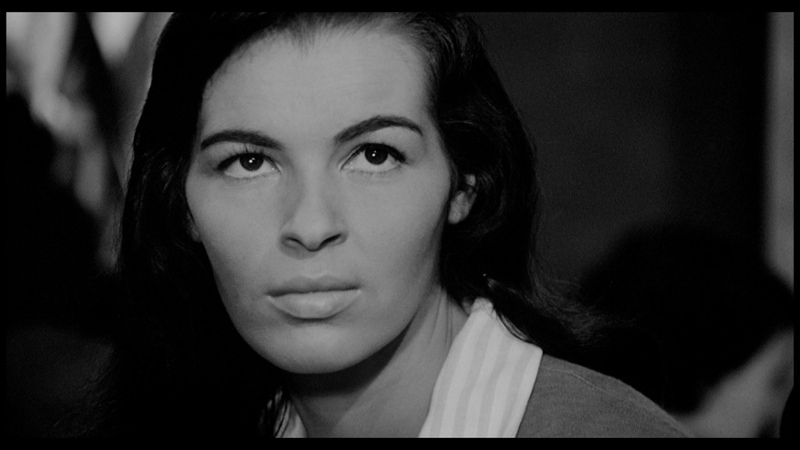 The first two, the narratives are unconnected, have a pronounced debt to neo realism; Ashes and Diamonds is a triumph of expressionist cinema.